There are two major limes that are consumed in the United States, Persian limes and key limes. Although Persian limes are the limes that you typically see in a grocery store, key limes are more tart, with a stronger scent and flavor. 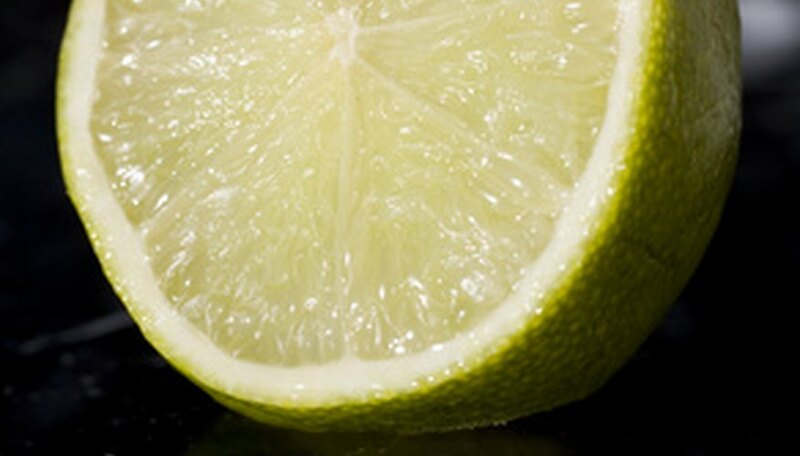 Key limes may also be known as West Indian limes, Mexican limes or bartender’s limes. The limes are yellow when ripe, and are used to flavor key lime pie. In northern climates, the key lime tree must be exclusively grown as a container plant. Even then, you can force a key lime to produce fruit. Move a potted key lime indoors during cold temperatures. Key lime trees cannot endure frost or freezing temperatures. Key lime trees thrive in temperatures that range from 70 degrees F during the day and 55 degrees at night. Place a potted key lime under plant grow lights when indoors and in full sun when outdoors. Key lime trees need 8 to 12 hours of sunlight daily to produce blossoms and fruit. Plant trees in potting soil that is well-drained. Fertilize by placing a granulated (2-10-10) fertilizer on the surface of the soil. Because all fertilizer varies in application rates, fertilize according to the fertilizer’s packaging directions. Fill soil to the top of the pot to prevent standing water and empty the drip pan. Standing water will promote root rotting, so water no more than twice monthly. Time your efforts to promote fruiting after the tree has reached maturity. Key lime trees grown from seed will not produce fruit during their first three to six years. Key lime trees grown from cuttings will produce fruit in their first year, and then will not produce fruit again for several years while it grows. Mist the leaves of a key lime daily to promote moisture in the canopy. Key limes thrive in the humid Florida environment and need additional moisture to cope with dry indoor conditions. Pollinate flowers by collecting the pollen from one flower on a paintbrush and transfer it to the stamen of another flower. Pollinating flowers of indoor plants helps to take the place of pollinating insects, and will cause the flowering trees to produce fruit. Remove suckers with pruning shears from the soil at the base of the tree. Suckers are new baby trees that spring up from the roots of key lime trees that have been potted. If suckers are allowed to thrive, they will rob the tree of nutrients that it might ordinarily put into fruit production. Pruning a key lime tree is not required. The tree will produce fruit whether you prune it or not. If you must prune a tree to improve the shape, increase the strength of the branches or remove deadwood, then wait until after the tree has produced fruit. A key lime tree produces fruit on the previous year's growth. Pruning too soon will prevent the tree from producing fruit.